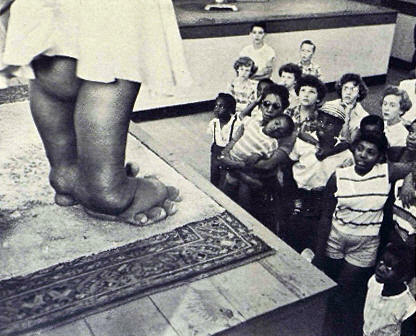 Talking to awed spectators, Sylvia tells them her right foot is larger than her left and measures 11 inches in length, is 91/2 inches from toe to toe. Philosophical abut her deformity, Sylvia says, "I always remember the Lord's Prayer, the part that says . . . let Thy will be done. It His will and there is nothing I can do about it." Wide-eyed spectators share with open mouths as Sylvia goes into her act at Chicago's Riverview Amusement Park, "I like the show for the experience of traveling and the interesting people I meet. But I would rather do something else." 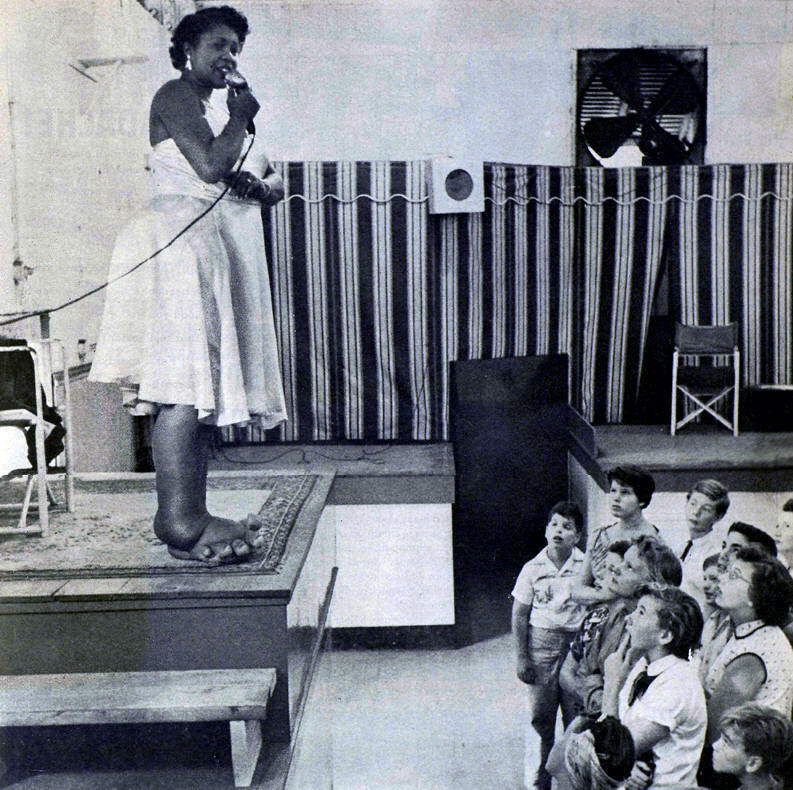 A FEATURED CIRCUS attraction, "Sylvia the Elephant Girl" is ballyhooed by sideshow barkers as the strangest sight in the world." A mystery even to doctors, she draws "oohs and aahs" and occasional outeries from the thousands who see her act. Sylvia, who has consulted many doctors, still has not received a satisfactory explanation of her strange condition. 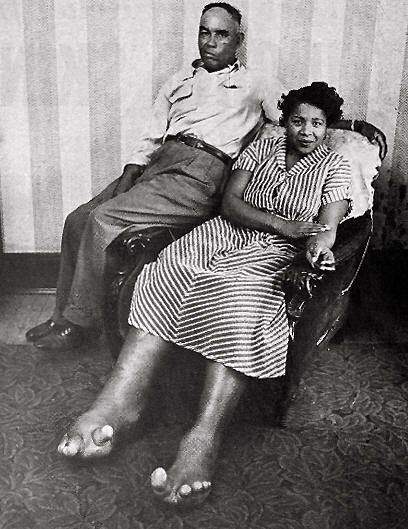 At first, doctors diagnosed her case as elephantiasis, a chronic disease of the skin. This diagnosis has been deputed by other doctors who point out that her malformation could not be elephantiasis since it has existed since birth. cures. Says she: "Only God knows the why and the when." Shy, in spite of her circus experience, Sylvia lives a quiet, simple life while traveling the circus circuit. She avoids social contacts and keeps to her hotel room where she reads (mystery stories and Richard Wright) a plays solitaire. "I don't get out much or do anything much" she says, "because I have sort of an inferiority complex. I hate for people to stare at me on the streets." (Above) Impromptu audiences like these Chicago children snicker when Sylvia walks down the street. Sylvia who spends the off-season in Mobile with her sister, says people there do not stare and poke fun at her when she walks down the streets. (Right) With husband, George Jackson, Sylvia relaxes in her hotel room after carnival show. Sylvia and George married in 1952. They met in Canada when George, a circus porter, found her alone and offered to go out and bring her some food. SINCE 1928 when a shocked midwife delivered her one could December day, Sylvia has known the anguish of being a freak and a human curiosity. "When I was small," she recalls, "I used to have a fight everyday. The children at school used to tease me until the teachers started punishing them. The teachers were real nice about it." Sylvia also found understanding within a sympathetic family circle. Unfortunately her mother died when she was only five and her father died when she was 11. Looking back, Sylvia recalls that her mother and father worked hard to provide her with adequate medical care. "We didn't have much money," she says, "but they did all they could." As a youngster, Sylvia led a full social life in Mobile where sympathetic neighbors never stared at her feet. She, therefore, felt more at ease with her friends. She wheeled about on bicycles and learned how to jitterbug and drive a cr. She had her share of boy friends, too. Says she; "There were always a couple." After her father died, Sylvia quit school and started to work. At 13, she was working as a short-order cook in a cafeteria and then got a job as a maid. When a circus scout offered her $40 a week in 1944, she accepted eagerly, explained later, "I had never made that much money before." Now a full-fledged circus attraction, Sylvia intends to remain in show business. With few exceptions, her experiences on the circus circuit have been profitable and enjoyable. "A lot of times," she says, "people come up and give me their blessing. Some people are nasty, though. Once I overheard a lady say people like me should be taken out and disposed of. I ignored her, I was so mad. The way I figure is that everybody means something to somebody, if nobody but their mother, and she had no right to say that."